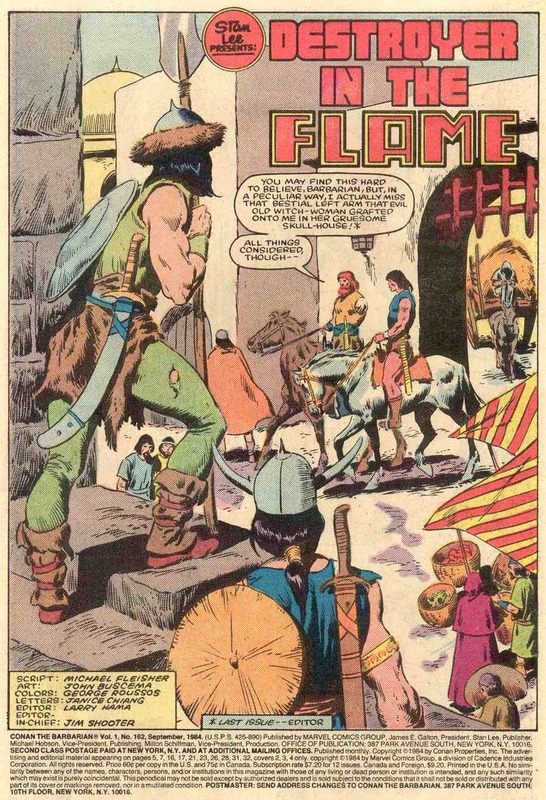 ABOVE: John Buscema, pencils and inks, Conan the Barbarian #162 (Marvel Comics: September 1984), page 1. 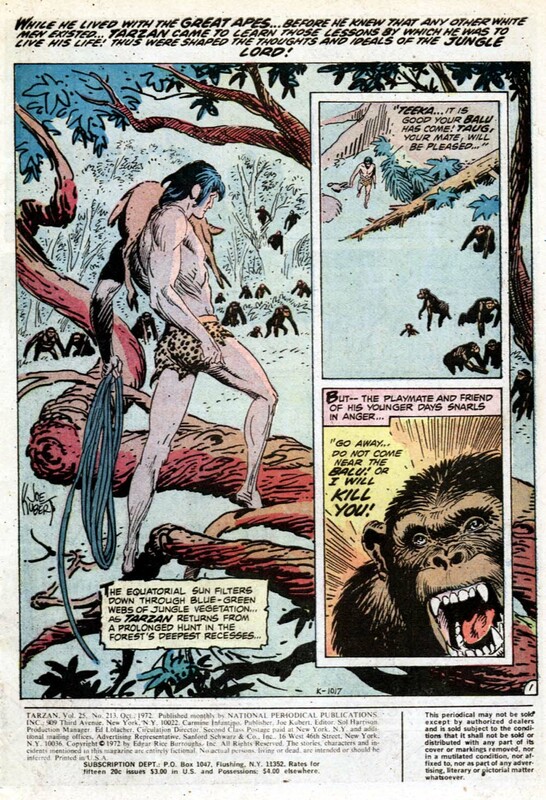 ABOVE: Joe Kubert, pencils and inks, Tarzan #213 (DC: October 1972), p. 1. I’ll tell you, I’m at the point where I’m not impressed with anyone anymore. I was always looking for the good draftsmanship. Later on, I became interested in the story-telling aspect of comics. I think Hal Foster is perhaps the best story-teller in comics. As was Milton Caniff. A lot of guys, like Roy Crane — all great. I did admire them, but now that I’m older, I’ve been in it for so many years, I can see things that I didn’t see before. I have the experience now. I have all the books of the collected works of Raymond, and of Hal Foster, and I’ve looked at the work of the old timers, and I’m not as impressed anymore. In fact, I see a lot of things they did, they could have improved upon. I see things now that leave me cold. I’m not impressed with anything in comics today. The only thing in recent times that I was impressed with, but not really floored by, was Tarzan by Joe Kubert. I think it was one of the best comics produced, of all times. I admire the guy. I think he’s fantastic, I really do. But that’s it. Maybe I’m too close to comics. Fine artists have learned through the ages by painting from sculptures and copying classic works but, when it comes to really knowing the figure, if you try to learn from copying other people’s drawings you end up with a double exaggeration. This especially holds true when the person who has really affected you and inspired you to draw like them is drawing an exaggerated figure to begin with. When you try to learn from an artist (comics or other) who is adding exaggeration, you end up exaggerating even more, which removes the figure from reality. One could be copying Mark Silvestri, who’s copying John Buscema, who’s copying Hal Foster, who did Life [sic] drawing! I find that, going back to Life drawing is like going back to the well — the source of inspiration — and it is a necessity which I find it [sic] absolutely essential.